The T100 air purifier is effective and portable. All you need is an electrical outlet and voila - you'll have clean air wherever you go! 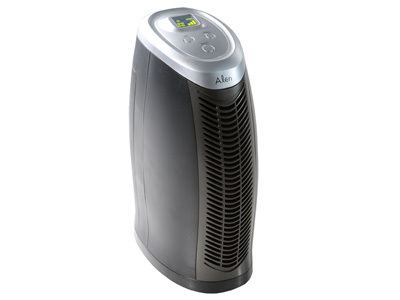 The Alen T100 air purifier combines a HEPA air filter, an activated carbon filter with an ozone-safe Ionizer to in one tiny package that packs a powerful punch! The HEPA filtration in the T100 air purifier eliminates pollen, pet dander, mold spores, dust and dust mites, while the Ionizer in the T100 air purifier promotes a healthy environment and the built in carbon filter in the T100 air purifier eliminates odor. Yes indeed this is a small but mighty air purifier! Pre-filter/HEPA Air Filter in the T100 air purifier tested to remove 84% of airborne contaminants in rooms up to 125 sq. ft.
Unit Size: 6" x 10" x 15"